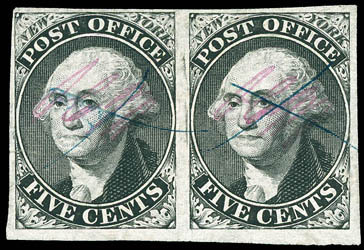 New York, N.Y., 1845, 5¢ black on bluish, horizontal pair, positions 39-40, blue manuscript cancels, ample to huge margins, wonderful early impression and color, Very Fine and choice; with 2015 P.F. certificate. 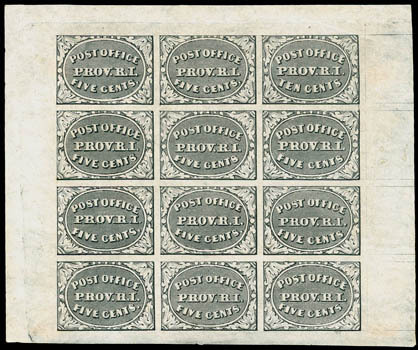 Providence, R.I., 1846, 5¢ gray black and 10¢ gray black, se-tenant, complete sheet of 12, full o.g. (small natural gum crease at top right not mentioned on cert. ), strong color and impression, particularly fresh, Very Fine; with 1964 P.F. certificate. 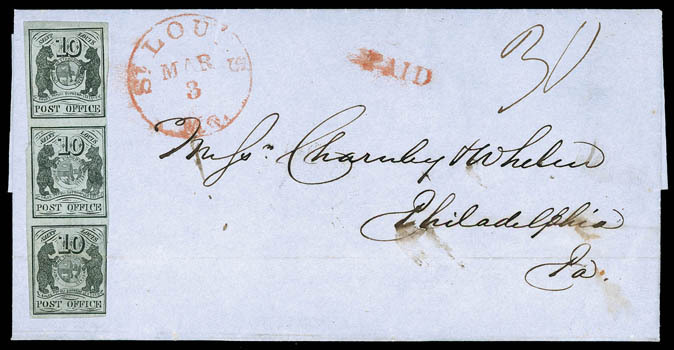 A VERY SCARCE COMPLETE SHEET OF THE PROVIDENCE, R.I. POSTMASTER PROVISIONAL.